S. Redon, M. Lin, D. Manocha, Y. J. Kim, Fast Continuous Collision Detection for Articulated Models, JCISE Vol 5(2), June, 2005. Y. J. Kim, G. Varadhan, M. C. Lin and D. Manocha, Fast Swept Volume Approximation of Complex Polyhedral Models, Computer Aided Design* , 36(11), Sep 2004. Y. J. Kim and C. M. Hoffmann, Dynamic Proximity Calculations for Situation Awareness, Naval Research Logistics* , 51(2), March 2004. Y. J. Kim, M. C. Lin and D. Manocha, Incremental Penetration Depth Estimation Between Convex Polytopes Using Dual-space Expansion, IEEE Transactions on Visualization and Computer Graphics*, 10(2), March 2004. S. Redon, Y. J. Kim, M. C. Lin and D. Manocha, Fast Continuous Collision Detection for Articulated Models, ACM Symposium on Solid Modeling and Applications, June 2004. S. Redon, Y. J. Kim, M. C. Lin and D. Manocha, Interactive and Continuous Collision Detection for Avatars in Virtual Environments, IEEE Virtual Reality, March 2004. Y. J. Kim and C. M. Hoffmann, Enhanced Battlefield Visualization for Situation Awareness, Computers and Graphics* , 27(6), Dec 2003. Y. J. Kim, M. A. Otaduy, M. C. Lin and D. Manocha, Six-degree-of-freedom Haptic Display using Incremental and Localized Computations, Presence-Teleoperators and Virtual Environments*, 12(3), June 2003. G. Varadhan, S. Krishnan, Y. J. Kim and D. Manocha, Feature-Sensitive Subdivision and Isosurface Reconstruction, IEEE Visualization , Oct 2003. Y. J. Kim, M. Otaduy, M. C. Lin and D. Manocha, Fast Penetration Depth Estimation Using Rasterization Hardware and Hierarchical Refinement (199 MB), ACM Symposium on Computational Geometry Video Review , June 2003. 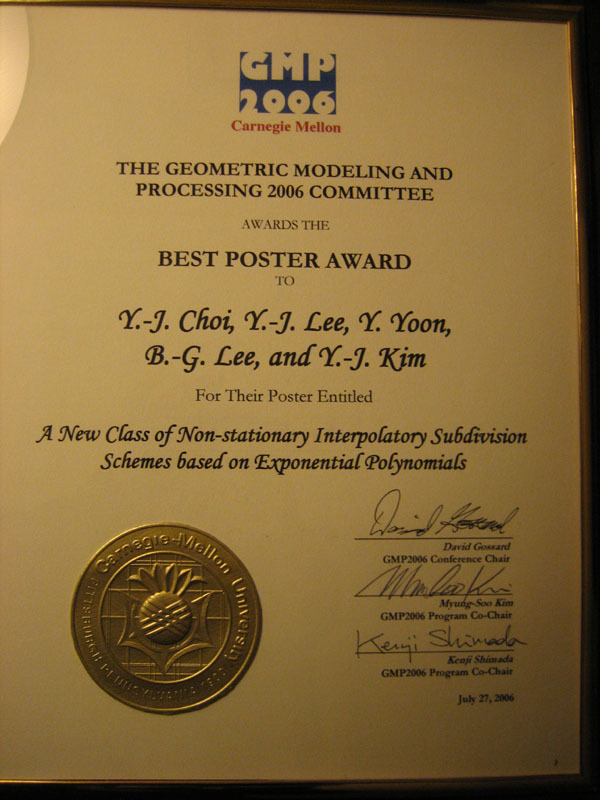 Y. J. Kim, G. Varadhan, M. C. Lin and D. Manocha, Fast Swept Volume Approximation of Complex Polyhedral Models , ACM Symposium on Solid Modeling and Applications, June 2003 (best paper award). Y. J. Kim, K. Hoff, M. C. Lin and D. Manocha, Closest Point Query Among The Union Of Convex Polytopes Using Rasterization Hardware, Journal of Graphics Tools, 7.4, 2003. Y. J. Kim, M. C. Lin and D. Manocha, Fast Penetration Depth Estimation between Polyhedral Models Using Hierarchical Refinement, International Workshop on Foundations of Robotics (WAFR) (also printed as a chapter in the book Advanced Robotics Series by Springer Verlag), Dec 2002. Y. J. Kim, M. A. Otaduy, M. C. Lin and D. Manocha, Fast Penetration Depth Computation for Physically-based Animation, ACM Symposium on Computer Animation, July 2002. Y. J. Kim, M. C. Lin and D. Manocha, DEEP: Dual-space Expansion for Estimating Penetration depth between Convex Polytopes, IEEE International Conference on Robotics and Automation, May 2002. Y. J. Kim, M. A. Otaduy, M. C. Lin and D. Manocha, Six-degree-of-freedom Haptic Display Using Localized Contact Computations, IEEE Symposium on Haptic Interfaces For Virtual Environment and Teleoperator Systems (Part of IEEE Virtual Reality), March 2002. Y. J. Kim, M. A. Otaduy, M. C. Lin and D. Manocha, Six-Degree-of-Freedom Haptic Interaction Using Incremental and Localized Computations (Extended Abstract), Workshop on Intelligent Human Augmentation and Virtual Environments (WIHAVE), UNC-Chapel Hill, Oct 2002. Y. J. Kim, M. A. Otaduy, M. C. Lin and D. Manocha, Fast Penetration Depth Computation Using Rasterization Hardware and Hierarchical Refinement, UNC-CH Technical Report TR02-014, 2002. Y. J. Kim, Visualization and Animation for Situation Awareness, Ph.D. Thesis, Purdue University, Aug. 2000. J. D. Walrath, R. P. Winkler, P. J. Emmerman, C. M. Hoffmann and Y. J. Kim, Visualization Technique for Improved Situation Awareness, SPIE Conference on Human Vision and Imaging, 2000. C. M. Hoffmann, Y. J. Kim, P. Winkler, J. D. Walrath and P. J. Emmerman, Visualization for Situation Awareness, ACM New Paradigm on Information Visualization and Manipulation (NPIVM), 1998. Y. J. Kim, Study on 3D Game Development, M.S. Thesis, Seoul National University, Aug. 1996. *: SCI (Science Citation Index)-listed journals.